SO MANY WAYS TO DONATE. SO MANY REASONS TO GIVE. Your contribution to the ISJL enables excellent Jewish education, puts rabbis on the road, brings programs to communities of all sizes, and supports the preservation and celebration of fascinating Southern Jewish stories. If you are interested in naming opportunities, endowments, and other major gifts, we would love to speak with you directly. Send us an email or call the office at 601-362-6357. Thank you! Your one time or recurring gift makes a real difference. Thank you! 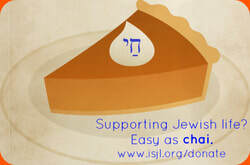 The ISJL is a 501(c) nonprofit organization, so your donation is also tax deductible as allowed by law. ​You will be provided with documentation of your gift. From all of our Board and staff, many thanks! What's the Chai Club? It's a special group of donors, committed to making a manageable monthly donation to support the ISJL. Most Chai Club members pledge a multiple of "chai," meaning life, which correlates to the number eighteen-- meaning donations of $18/month, $36/month, $72/month, and so on.... but any amount is welcome! 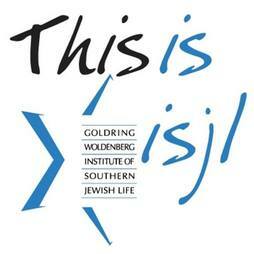 Join Giving Assistant now and support Institute of Southern Jewish Life for free! Shop online at stores like Kmart, Home Depot, and Bed Bath & Beyond and earn 3-30% cashback donations. When you want to celebrate a friend's recent achievement, or remember a loved one's incredible life, an honorarium or memorial is a wonderful way to mark the occasion. When you send a gift to celebrate a life event, to honor someone or to offer your sympathy, the Institute will send a personal card to the designated recipient. The card includes your name, address and the occasion for sending a contribution, without denoting the amount of your gift. Learn more on our Honorariums & Memorials page! Special Note for American Express card holders: Did you know you can donate to the ISJL through GivingExpress? Just click the icon below. Terms and Conditions: * Terms and Conditions for the Membership Rewards program apply. Visit membershiprewards.com/terms for more information. Participating partners and available rewards are subject to change without notice. Bonus Points: To be eligible to earn bonus points, you must be enrolled in the Membership Rewards program at the time of purchase and you must charge your purchase on an eligible, enrolled American Express Card. Bonus points will be credited to your Membership Rewards account 6-8 weeks after your first purchase appears on your monthly billing statement. 50,000 maximum bonus points per account. Bonus ID 0549. Please note: American Express will deduct a transaction fee of 2.25% from your donation to cover processing costs. The charities will receive your donation amount, minus the 2.25% American Express processing fee, from our partner JustGive. This transaction fee is similar to or less than the processing fee the charity would pay if you were to charge your donation with your American Express Card through any other means (i.e., over the phone to the charity, through the charity's website, etc.). You will not be charged any additional fees for using the American Express Donation Site and your dollar donations are tax deductible to the extent allowed by law. We'll periodically post specific items needed, volunteer opportunities, challenge campaigns and other ways to support the ISJL. Thanks for your interest! You will be redirected to PayPal.com to complete your secure payment. Your gift is fully tax deductible, less the value of any benefits received.